The 1017 Nu-Rail® Crossover Fitting attaches a 0.75 in. IPS pipe to another 0.75 in. IPS pipe. The most common use of the 1017 is on our 019ALU Crossarm. A listing of sensors commonly used with the 019ALU appears in the Compatibility information. The 1017 NU-RAIL® Crossover Fitting connects a vertical 3/4" IPS pipe to a horizontal 3/4" IPS pipe. It typically attaches a sensor with a 3/4” IPS pipe mount to a 019ALU crossarm. The 1017 has two ovoid segments that are oriented at a 90° angle. Each segment accepts one piece of pipe allowing a vertical pipe to be secured to a horizontal pipe. The horizontal and vertical pipes are secured to the 1017 fitting using screws, which are tightened with an Allen wrench. The 1017 compatible with sensors that have a 3/4 in. 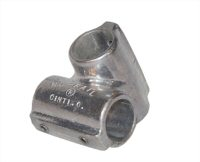 IPS pipe mount (1 in. OD).